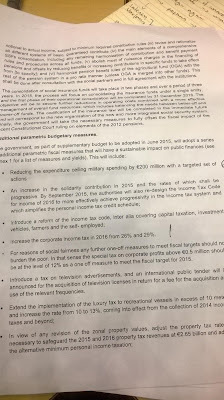 Officially unconfirmed reports from Brussels summarise this year's fiscal measures being imposed on the Greeks as below. They would extract an extra 2.7bn euros from a stagnant economy this year, and 5.2bn euros next year (1.5 and 2.9 percent of GDP respectively). These measures are designed to keep the budget balanced and produce primary surpluses of one and two percent respectively. However, they would further burden Greek enterprise, which is already struggling with a steep drop in demand this year, an almost complete lack of investment liquidity in banks for the past six and a half years, increased taxes on property and profits, and for importers the loss of customary three-month credit from their overseas partners. The measures will also scrap the ruling Syriza party's promise to abolish a crisis-era property tax and to refuse to impose recession-producing measures such as new taxes; in fact the measures ensure that 2015 will see another steep recession, with dark prospects for 2016 as well. 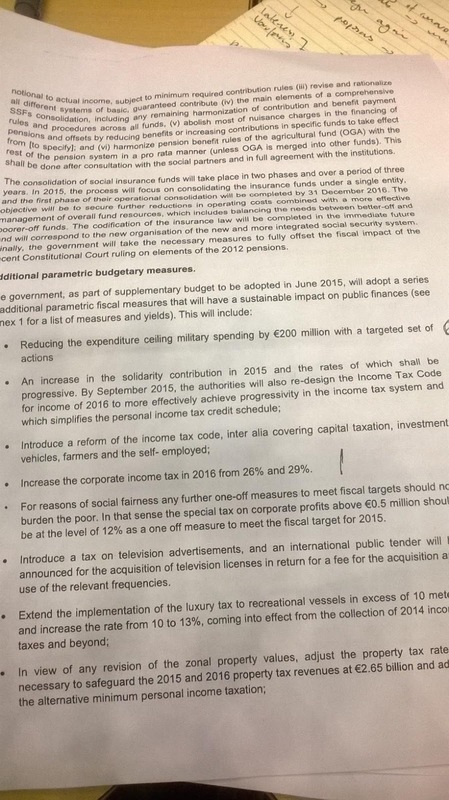 Further reading on the current package under discussion and Greece's two previous bailouts on Navigator Consulting.